The original 11-D formula is the most widespread 11-D product. particles and various binding materials to provide a maximum result. 11-D Universal Sealant can be applied through the valve of the tyre. 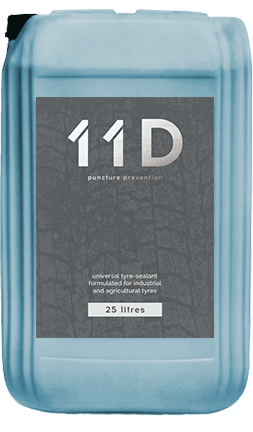 11-D is a tyre sealant which prevents and repairs 95% of all common tyre failures and punctures up to 15 mm in its universal version and more. 11-D Universal also regulates a constant air pressure and cooler tires that last longer. 11D Universal helps eliminate porosity leaks that cause tires to naturally deflate over time. Properly inflated tires run cooler, last longer, and help improve your vehicle’s fuel economy. Tires that are properly inflated and balanced run cooler and last longer. Less flexing, bounce and fatigue means cooler tyres and enhanced casing life – up to 25% or more! 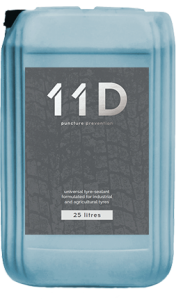 11D Universal is a tyre sealant which prevents and repairs tyre punctures up to 15 mm in its universal version and more! 11-D Universal works at temperatures -40 C + 40 C.
11D Universal makes any tyre into a self-sealing tyre. By eliminating 85-95% of flat tyres due to punctures in the crown of a tyre, we can keep your fleet running, reduce costly road service calls, and eliminate run-flats. 11D Universal is water based product is non-flammable and non-toxic and a 100% bio degradable. 11D Universal is easily applied through the valve of any tyre and easily removed with water when the tyre is disassembled.